May be claimed for having contacted (heard) with 1,000 different cities, "Guns" (see JCG rule) and/or "Ku" (*) using at least 2 bands, and received 1,000 QSL cards from contacted station. Endorsement stickers are issued at the revel of each additional 500 (below 3,000) and each additional 250 (above 3,000). *Contacts with a some city,"Gun" or "ku" can be counted on each frequency band. So, if you have contacts with a same city on 5 different bands, that would earn you 5 counts. * Ku means an administrative unit (=ward) in big cities of Japan. For example, Tokyo-23 wards and Yokohama, etc. are divided into several Kus. 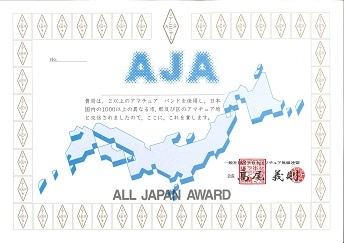 You can download the list of Japan's all Kus. Please click Ku in the left flame page. Contacts with such big cities which are separated to several Kus should be counted as each Ku's points only. You cannot count such contacts as cities points. But, contacts with those big cities they don't have been separeted to Kus yet, shoud be only the city's points. For example, Saitama-city (JCC number:1344) was sapareted to Nine Kus on April 1, 2003. Your contacts with Saitama-city on and after April 1, 2003 must count as only Kus points. Your contacts with Saitama-city before April 1,2003 should be counted as Saitama-city.